Brickside Brewery, Copper Harbor's first Microbrewery. Opening a microbrewery in Copper Harbor, MI Help us realize this dream of craft beer in the northern woods. 379 backers pledged $21,971 to help bring this project to life. This is your chance to be a part of the craft brew movement! We need some moola so we can begin brewing our own beer at a commercial level, meaning you can finally get your hands on a great tasting Brickside brew! - Kickstarter allows people like us, with unique dreams, a chance to make them come to life with help from supporters like you. - Kickstarter will only charge your card if we reach our goal of $20,000 by the deadline. - If we can reach $20,000 with in the 45 days we have allotted you can be proud in the knowledge hat you helped make a great idea come alive. STEP #1: Sign into Kickstarter - all you need is an e-mail and create a password, it is that simple. STEP #3: Kick us $1 or more and your card will only get charged once we reach our $20,000 goal! And remember we can always raise more than the stated amount! A small microbrewery making a solid core of vibrant beers, with unique, unusual beers made from local ingredients. A thimbleberry stout, a Rhubarb Amber, yes these are all in our plans, and more. We also have been growing hops! The plants are on their 3rd year, are producing well, and the rhizomes can be split next spring. This means fresher hops, as well as some amazing IPAs, Torpedos and hop bombs in late summer just after harvest. There is a myraid of traditional and historical beers that can and will be made. As well as exposing people to the joy of flavorful, handcrafted beer. Remember if you own ANY interest in another liquor licence,or distributor, that this violates the three tier system and its laws. This was clarified this past December and no person can have any connection to another part financially. You get a brick with your name on it for the brewery wall, a custom Brickside Brewery bumper sticker, or window decal and also mentioned on the website as an official backer. A brick, website fame, and a custom Brickside Brewery pint glass. a brick, a pint glass and a sticker. Not to mention the website immortality. 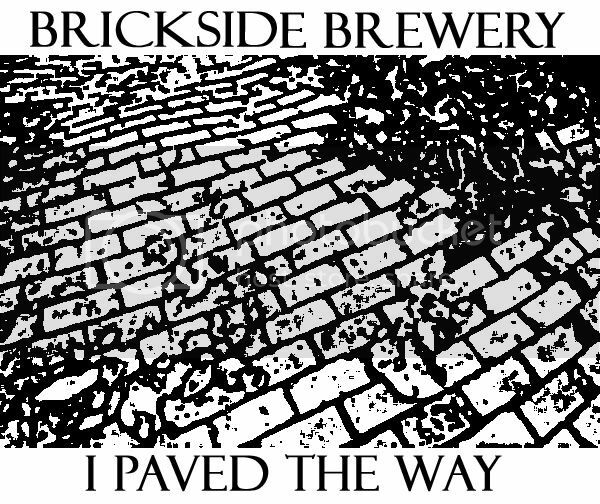 An original custom Brickside Brewery (Kick starter only) logo t-shirt. From now on I figure you know about the brick and website part, everyone gets that from $5 up to the maximum. T-shirt and sticker. Show your support to the public. You get a brick, and a custom Brickside Brewery( Kick starter only) logo growler. You get you all the previous backer rewards. A shirt, pint glass, growler, sticker, and the brick in the wall and the name on the website. Ticket to the grand opening beer dinner party for two plus, T- shirt, glass and sticker. 2 tickets to the grand opening beer dinner party, and assist in making a brew as well as the sticker, t shirt, and glass. Help with label design and naming of a beer. (with in allowable language), as well as the growler, glass,t shirt, and sticker. You get a to name a fermentor or put your own name on it, as well as the rest of the swag. We help you create your own beer! You choose the style of beer, how you prefer it, the name, the label, everything! All within acceptable legal bounds of course. That really only applies to the name and artwork, some things just don't fly. Gets you an all inclusive three day weekend trip to Copper Harbor, that includes 3 meals a day at the local restaurants, your choice of local lodging, and all of the previously named backer rewards.